The most common hedging plant of the Laurels is Cherry Laurel and it's not the country's biggest selling hedge plant species without good reason! 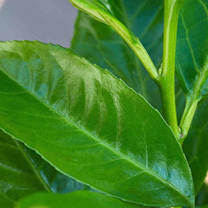 Cherry Laurel is a fast growing hedge (without being a bully), with large, glossy bright green leaves, is fully evergreen, very easy to grow and easy to maintain. Laurel is suitable for hedging from 1.5m up to 5m so we have it at all heights from 30cm up to over 2m. It's one of the few evergreen species that can handle being grown as a bare root plant so that's a very economic way to establish a new hedge. Flowers mid May-October producing white flowers. Grows 30-60cm per year. Supplied as 40-60cm bare roots. The most common hedging plant of the Laurels is Cherry Laurel and it's not the country's biggest selling hedge plant species without good reason! Cherry Laurel is a fast growing hedge (without being a bully), with large, glossy bright green leaves, is fully evergreen, very easy to grow and easy to maintain. 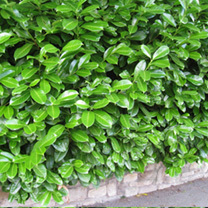 Laurel is suitable for hedging from 1.5m up to 5m so we have it at all heights from 30cm up to over 2m. It's one of the few evergreen species that can handle being grown as a bare root plant so that's a very economic way to establish a new hedge. Flowers mid May-October producing white flowers. Available in packs of 25 or 50 bare roots and grows 30-60cm per year. Ideal for beds and borders. Attractive to butterflies, bees and birds. Prefers full shade but grows in shade as well.